Rescuers continued searching over the weekend for more than 100 people still missing as the death toll from the dam that collapsed outside Jakarta on 27 March climbed to 96, officials said. "Search and rescue is still ongoing as some bodies were found in the Pesanggrahan River, 3-5km away from the dam," Priyadi Kardono, head of data and information for the National Disaster Management Agency, told IRIN on 29 March. "Some were also found inside the wreckage of houses." Rescuers were searching for 131 people believed to have been swept away by the deluge that surged through the industrial town of Cirendeu, in the city of Tangerang, Banten Province, outside the capital, after the 10m-high earthen wall of the Situ Gintung reservoir collapsed due to heavy rains. Local residents compared the surge to a mini tsunami, which caused flooding of up to 2m, destroying houses and upending vehicles in its path. Search and rescue efforts were easier now, Priyadi said, as the waters had receded, allowing the use of heavy equipment to sort through the rubble. However, he was not optimistic about the chances of those still missing. “We don’t think we’ll find more survivors,” he said, as the third day of rescue efforts came to a close. “But we’re not sure if all 131 missing were actually at the site when the disaster occurred. Some of them are students staying in boarding houses who may have gone home for the long weekend,” he said. Priyadi added that 319 houses were now confirmed to have been completely destroyed, in addition to a mosque and a pre-school, out of the almost 500 houses estimated to have been affected. 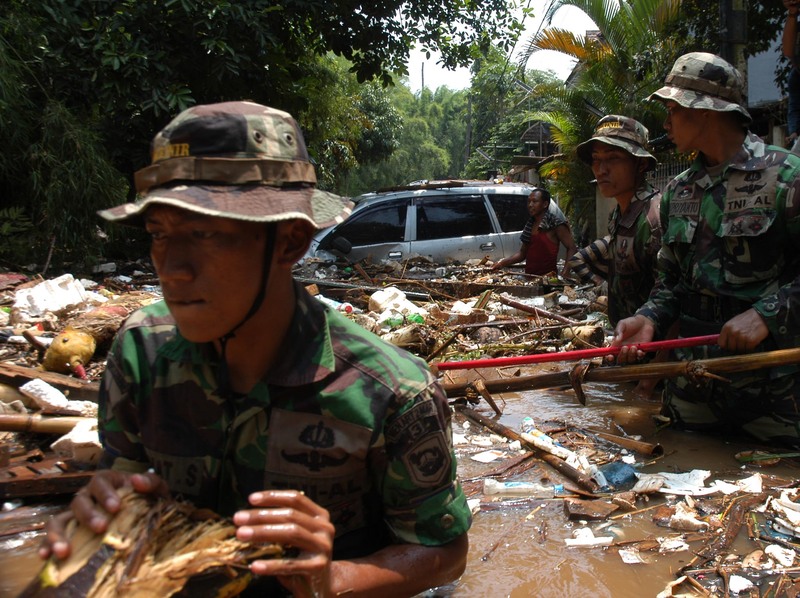 At least 50 people were killed and scores more were injured when a dam burst outside Jakarta on 27 March 2009, impacting at least 2,000 people in the industrial town of Cirendeu in Tangerang, Baten Province. At least 400 homes were affected. The disaster has prompted the governor of Jakarta, Fauzi Bowo, to call for the inspection of all 26 dams in the capital, as it was revealed that Situ Gintung, built by the Dutch in 1933, showed cracks as early as February last year. Meanwhile, 368 survivors are still staying at temporary shelters in Muhammadiyah University-Jakarta and local government offices, while more than 1,000 have returned home. Arifin M. Hadi, head of the disaster management division of Red Cross Indonesia, told IRIN some of the unaffected homes in the area were now hosting 10-15 people each. Nevertheless, both officials said those affected were doing well and had more than enough supplies of food, blankets and other necessities from local NGOs and politicians. No significant health issues have been reported. “The only problem now is distribution,” Arifin said, adding that political parties campaigning ahead of legislative elections next week had provided most of the donations. “They cannot be distributed because we lack volunteers,” Priyadi added. Priyadi expects the homeless to stay in the shelters for two more weeks at most. The government has promised assistance to help rebuild the damaged homes, but Priyadi said a meeting was scheduled for 30 March to assess how many of the homes could be rebuilt, and how many needed to be relocated. According to the UN Office for the Coordination of Humanitarian Assistance, there has been no request for international assistance.